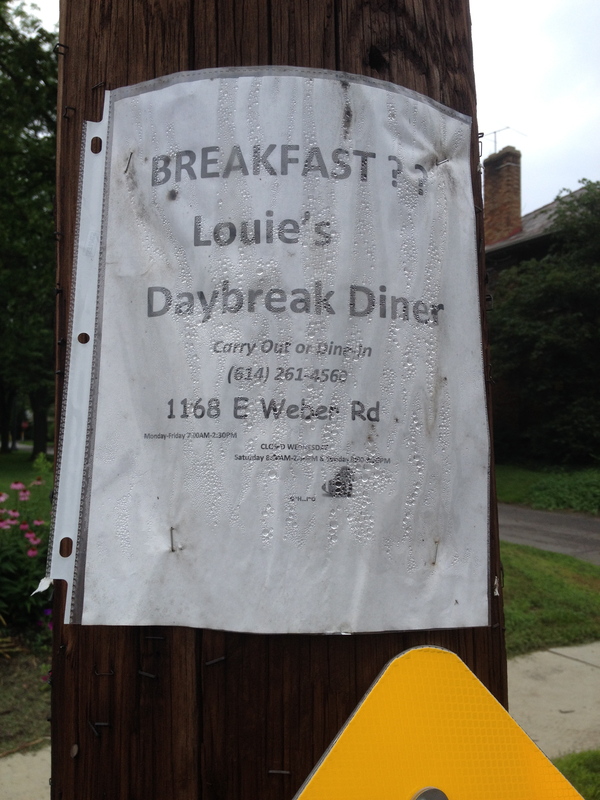 Old School advertising brought me to Louie’s Daybreak Diner. During my daily walks with CMH Tobias I walk by the sign you see above. This battered banner is right in front of a church / school so during the school year and every Sunday, hundreds of people walk by this sign. In the age of social media, SEO, etc., you have to respect someone with the thought to try some old timey marketing. Granted, I have walked by this sign for almost a year, but it worked. Another thing that inspired me is the proximity to Susie Sub Shop, the best place for subs in town. My first visit was on a Wednesday, which did not work out so well because the business is closed on Wednesdays – but looking at the menu on the door, it seemed like they had some good specials. On my next trip, I took a very pregnant Mrs. Gourmand. She has the BLT which she reported was exactly what she wanted: well toasted Texas Toast, crispy, meaty bacon, lettuce and tomato with a little mayo on the side. I ordered the Reuben. I must admit I was very disappointed. The Reuben is $8.00, the version I had was worth $4.00. It was generic wheat bread, with three slices of corned beef, some cold sauerkraut, an afterthought of melted cheese and a volume of salad dressing from a bottle which had greater weight than the meat, cheese, and bread combined. My report, it was a let down and a definite “meh” sandwich. On the other side of the plate, the hand cut fries, although a trifling portion, were among the best I have had anywhere. Mrs. Gourmand agreed. I can’t fault the place, only myself. I violated the a cardinal rule: only get a Reuben from a Deli. 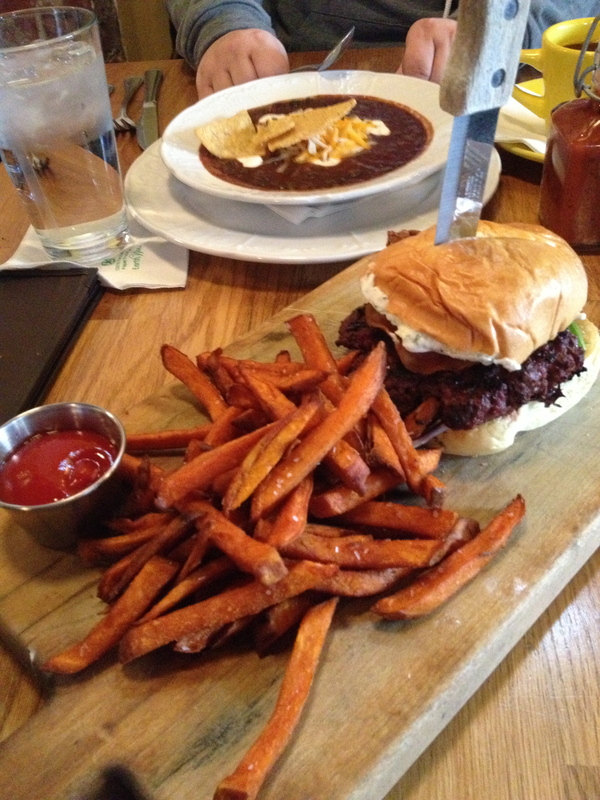 In spite of the fries, if I come back to the area for lunch, I’ll be going to Susie’s next door. However, I will be heading back for breakfast sometime. 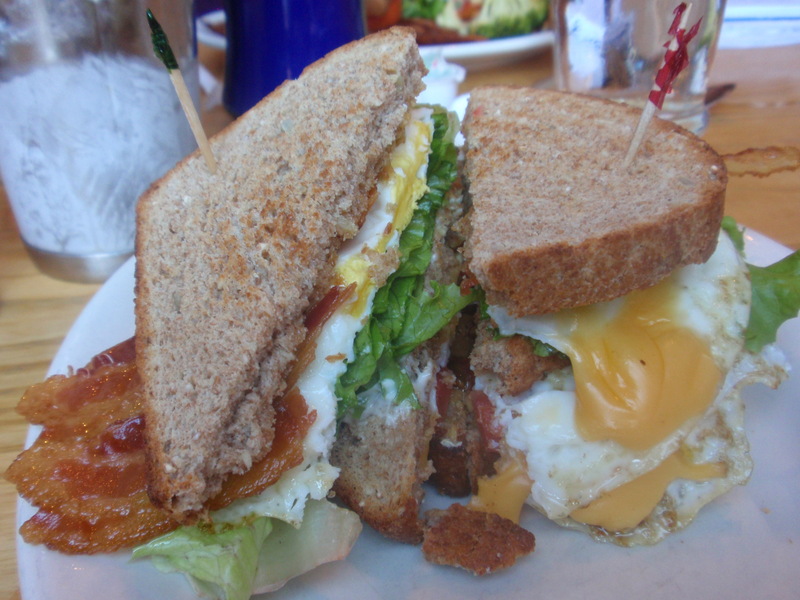 The breakfast menu is extensive and has two off the beaten path menu items. The first is Bill’s Breakfast Rice: Rice, sausage, Onions, mushrooms, soy sauce, with cheddar cheese and served with toast. Intriguing to say the least. The second item f note is the Panhandler: choice of pancake, french toast or biscuit on the bottom then sausage gravy, hash browns, two eggs, then cheddar cheese and choice of meat. A final point of interest. 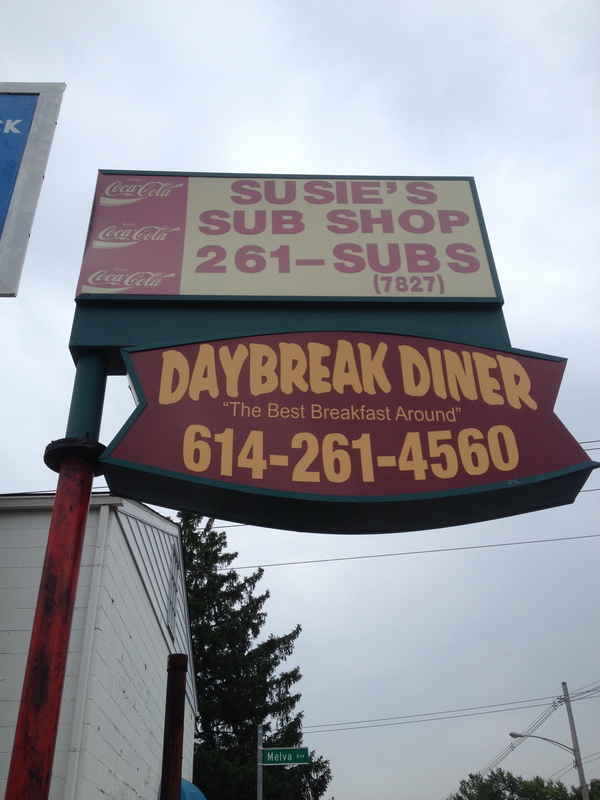 I noticed there is a service window connected the diner to the sub shop next door. I asked our server / grill cook about it and she shared that the owners of both businesses and best friends and that family members work shifts at both locations. These two places definitely put the neighbor into neighborhood business. I had an axe to grind regarding brunch at Pistacia Vera. Don’t get me wrong, I love Pistacia Vera and I think the world of Spencer and Anne. Here’s the thing, as you know, I am not a fan of breaking fast (reasons outlined logically in previous posts). I might even be the Grinch of breakfast. I was miffed during the most recent Dine Originals Week. Historically my Dine Originals Week ritual is to get the $10 Pistacia Vera tasting box to cap off the week. Well, last time there was no box just a brunch deal. Hrumph! I started to hear high praise for the brunch options from many credible sources. I am not a fan of quiche (only because it is so often prepared poorly) but quiches as well as Shirred Eggs and a Cottage Ham & Brie Sandwich were repeatedly mentioned in my presence. Hmm. 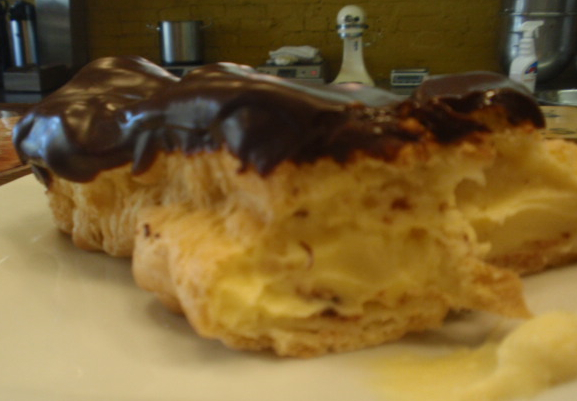 Sandwich on a Pistacia Vera Croissant….I could do that and sniff out these other offerings in the process. I went on a reconnaissance meal with my diner-in-chief. I was happy to see Jim Budros sweeping the front walk at the German Village shop (Jim is a BBQ Master, Pizza Purist and father of Anne and Spencer). Looking at the menu, I was hooked so we committed to two dine in brunch options. 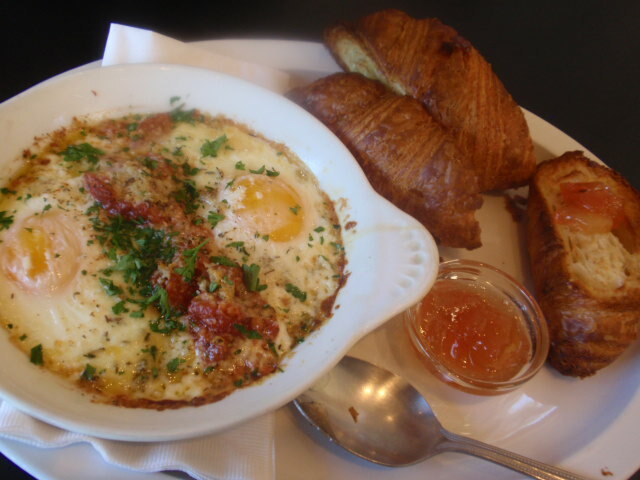 We tried the Shirred Eggs: two eggs, baked in cream with parmigiano, oregano, garlic, herbs, and tomato fondue. This is served with a toasted, sliced croissant and house-made preserves. The verdict? Superior, perfect, excellent. This now on my top three breakfast/brunch picks (the other two being the Pattycake Bakery Orange Sticky Bun and the Egg Sandwich at Explorer’s Club). Selection number two was the Cottage Ham and Brie Breakfast sandwich: smoked cottage ham, fromage d’affinois, Dijon mustard, cornichons, fresh greens on a toasted whole wheat croissant. Thoughts on this one? Also excellent, easy to share and conveniently, could hold its own in the lunch category. These two entrees made for a great meal, but there is much more than makes brunch at Pistacia Vera special and well worth the effort. Columbus is fortunate to have several excellent coffee roasters. One that tends to stay off the radar due to a consumer unfriendly approach to opening hours is Cafe Brioso. 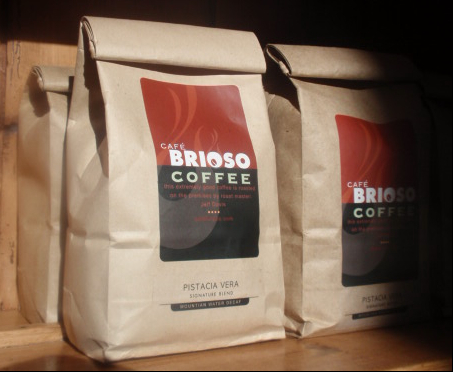 Pistacia Vera serves several Briso blends and sells bags of ground Briso coffees. Having access to this coffee to drink and buy at more customer friendly hours is a boon. Pairing Pistacia Vera with Brioso is genius. Maybe this is starting to read like a commercial or product endorsement? Well, this paragraph is brought to you by Pistacia Vera Preserves. My modest serving with the Cottage Ham and Brie sandwich was good enough to inspire me to purchase two jars. If you are reading this before Christmas, a few purchases at Pistacia Vera could cure your own Grinchness or make you the hero of a holiday gift exchange. And, let’s not forget the primary reason to visit Pistachia Vera – chocolates, macaroons, tortes and more, oh my! 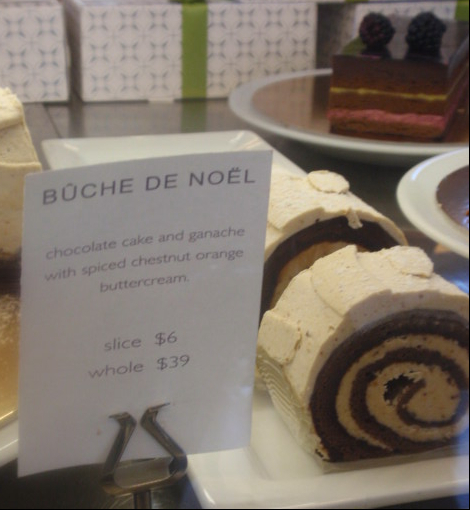 We opted for a pre-brunch appetizer of a Buche de Noel (Christmas Log). A slice of log is a great way to celebrate the season and Pistacia Vera makes the best in Columbus. Humbug? I am now the Grinch who ate breakfast. 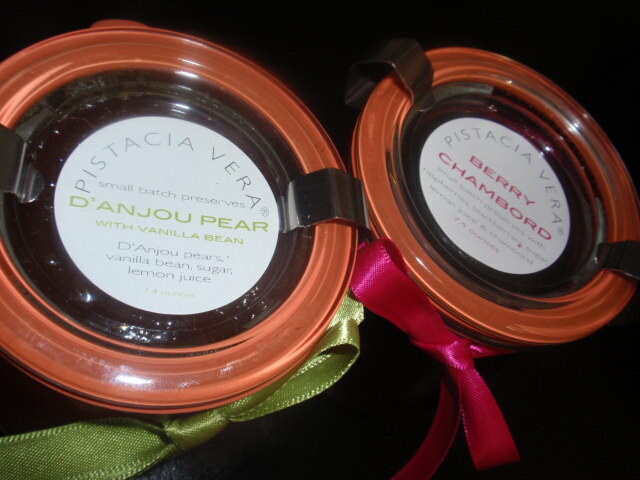 Thanks Pistacia Vera. One final, but vital note. the Hot Chocolate at Pistacha Vera is the best in town. Better and less expensive than Northstar and Jeni’s. This proclamation may be sacrilege to these two culinary holy cows but if you charge $4.50 for hot chocolate it should be orgasmic, Pistacia Vera hits the mark at $3. 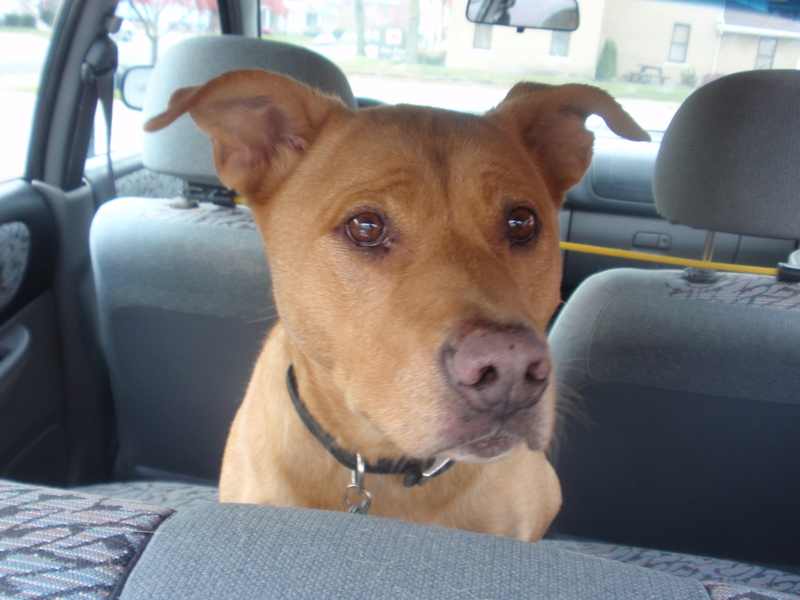 Now I am off to put antlers on CMH Tobias. The Angry Baker is anything but angry. Friendly and engaging, Vickie Hink made her way to Columbus to pursue a culinary path. Along the way she moved to Olde Town East and shifted her focus to baking. 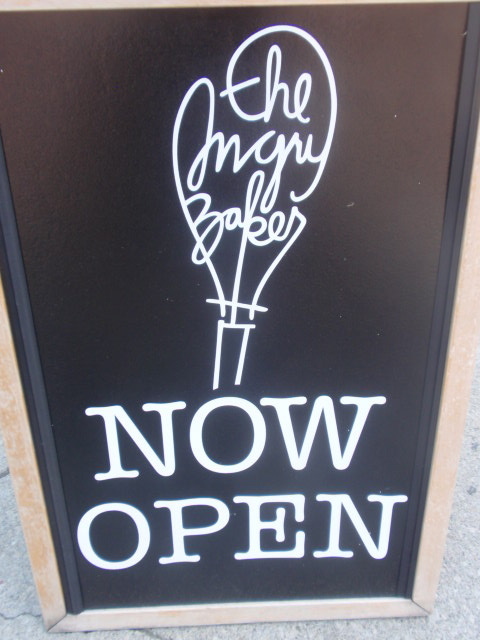 Shortly after Yellow Brick Pizza opened she walked by the space she now bakes in and decided it would be the perfect spot for her own bakery. This up and coming Olde Town culinary block will soon be joined by a tavern serving Ohio beers and sandwiches with Angry Baker buns. This is an exciting time to live in the area and certainly something to be happy about. Vicki gets up at 4 am to bake a variety of breads including Brioche. The day starts with breakfast, which is served all day. The crowd pleaser is the Egg Sandwich featuring a fried egg with Bluejacket Dairy Ludlow cheese on a Bacon, Swiss & Chive Scone. Lunch and later includes soups, salads, sandwiches and (vegan) desserts. 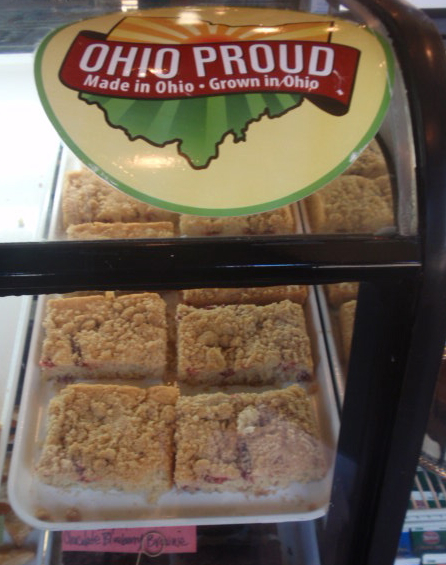 Many of the ingredients are Ohio Proud such as: Sharp White Cheddar (L.W. Randal’s, Warsaw), Mayfield Havarti (Orwell), Turkey from Cooper Farms (St. Henry), Eggs laid at Hillandale Farms (Croton) and oats, flour, bran, honey, maple syrup – Stutzman Farms (Millersburg). on Brioche served with a side salad. 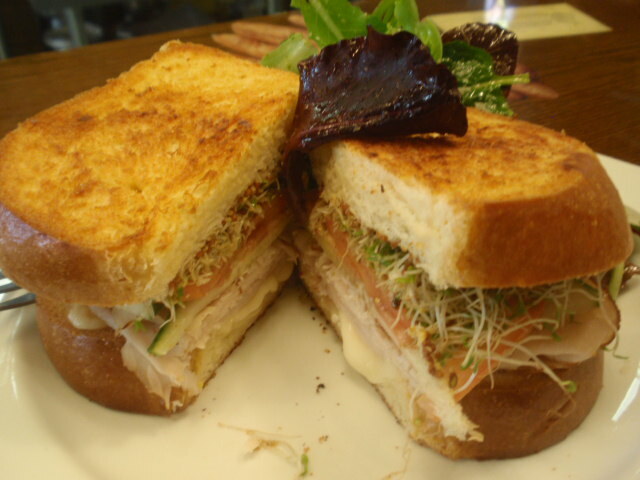 The sandwich was hearty and tasty. I would get it again. I might get two. In the dessert category I tried the Blueberry scone (rated 10 out of 10 on the scale of perfect sconeness), the vegan chocolate blueberry brownie (dense, tasted of chocolate without blocking the blueberry flavor) and after seeing the neighboring couple take one bite then sigh with pure bliss – a chocolate eclair (the yellow custard had flavor, richness and thickness with the dough and chocolate complimenting the filling with balance). Did I like the dessert? My run-on description should attest to my feelings on the matter. The space is small with a tiny table and bar counter seating six or so. There is a table outside as well. Most of the orders are to go. If you have time, score a seat at the counter to watch Vicki construct sandwiches with speed and grace at an incredible pace without breaking a sweat. Placed under the plastic countertop are copies of recipes and cooking notes which creates the feeling of being in Grandma’s kitchen. This practical decor is integrated with the rest of the urban folk style art throughout the space. 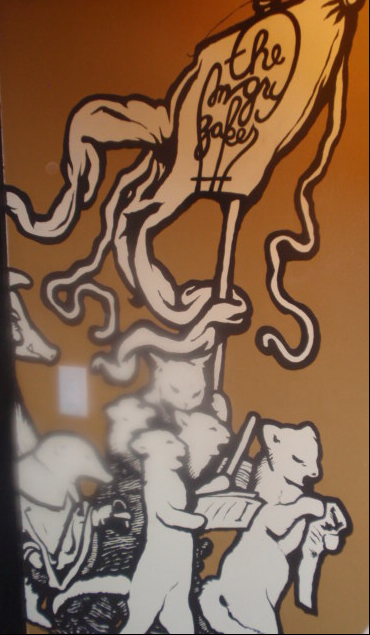 The highlight of the art (all by the same designer) is the bathroom mural. 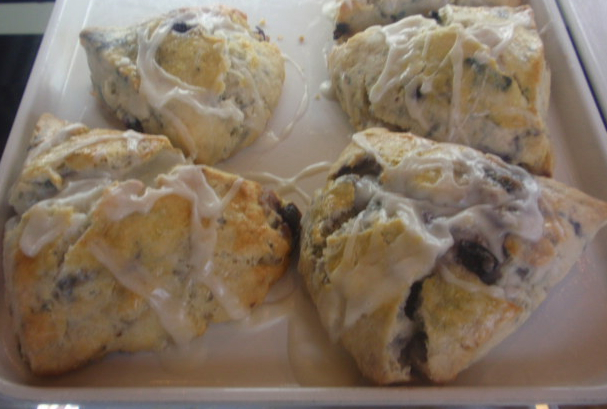 If you bake it or pour it, they will come and that is what is happening in Olde Town East. A bustling culinary block is building a better community. The best donuts in Ohio are at Donald’s Donuts in Zanesville. The second best donuts are from DK Diner in Grandview. 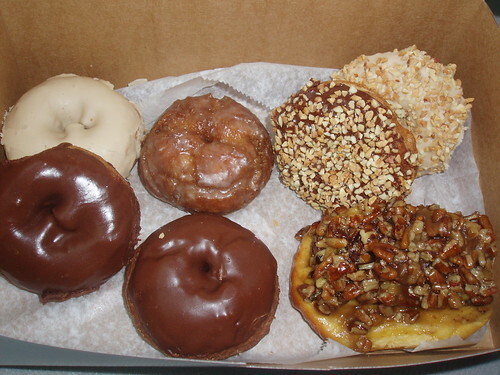 Exception: if someone brings you DK Diner Donuts…those are the best donuts you will ever have. In Lancaster, a local legend has the third best donuts in Ohio. 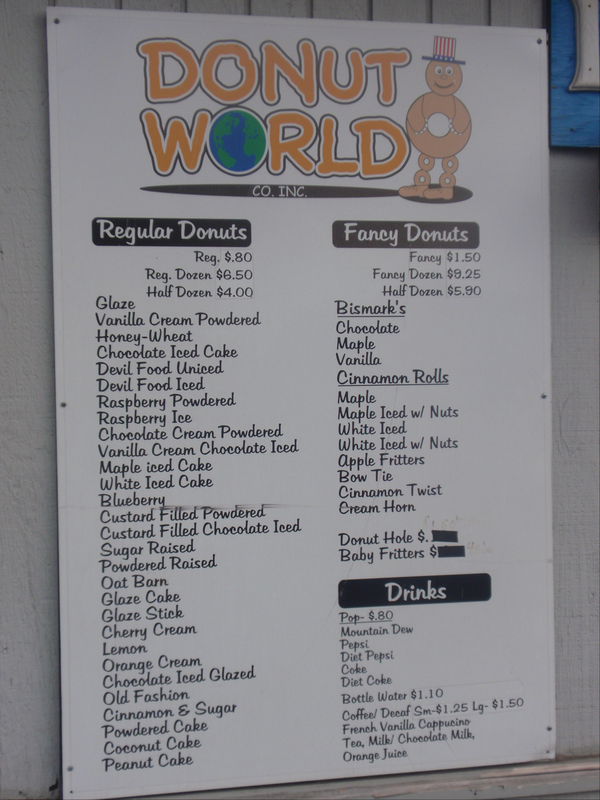 In respect to their pumpkin donuts, some of their “fancy donuts” and 24 hour access to donuts on demand, Donut World may take the cake and place first in some critical categories. 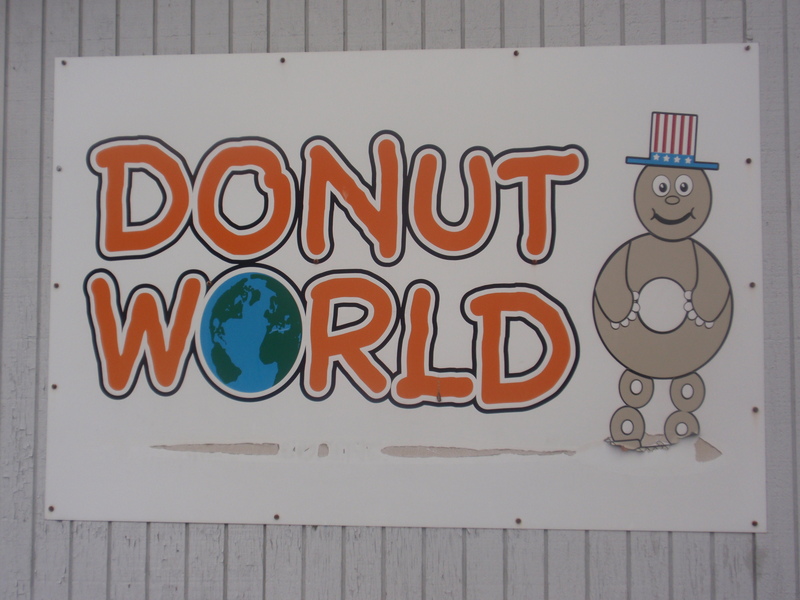 As I wait for typed indignant outcry, let me share what I know about Donut World. My first encounter was a classic case of it’s not what you know but who you know and what they can be talked into. My friend Amanda Anderson used the power of twitter to have Harold LaRue-Lessner (of Dirty Franks fame) deliver a box of Donut World donuts to his restaurant for holding. Amanda picked up the loot and then I looted her box for a few samples. Based on this experience of second hand donuts I noted I should get more soon. So I did. My first visit was thwarted by a parade, traffic barriers and about fifty people in line for the newest batch of pumpkin donuts. I aborted my mission to go drinking. About five hours later I returned to the scene of donut fail. 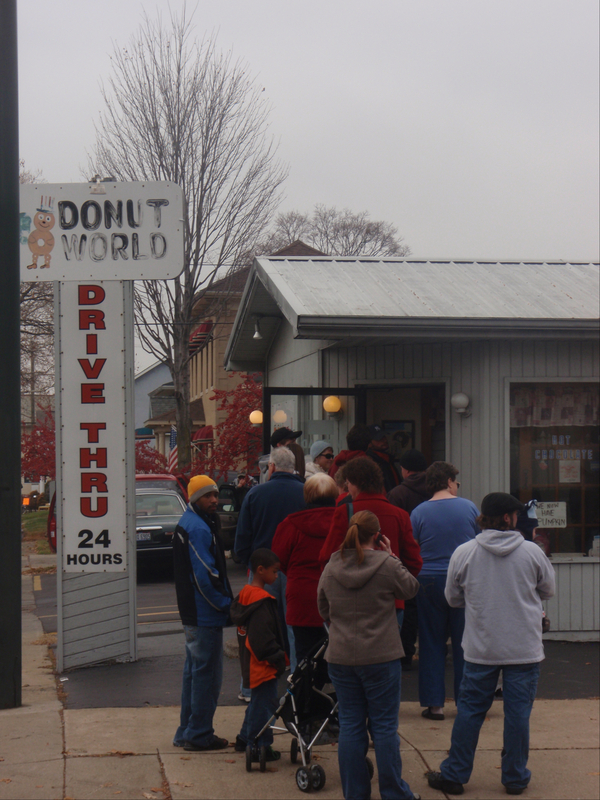 Donut World has an impressive line up of thirty plus donuts, fritters, Bismarks and donut holes. Categories are broken down into Fancy and Regular donuts with iced, powdered, cream-filled and other variants. Drool. Since pumpkin donuts were in season and made minutes before my arrival I stuffed two of those in my mouth and selected a mixed box of ten more to go. I proclaim the donuts to be very good. The remainder of the box ended up at Bono Pizza later in the day with no survivors when I left the premise. Five out of five donut eaters say Donut World is awesome. I rest my case. Also of note, there is a dentist office on the other side of the parking lot. Did I mention Donut World is open 24 hours? So unless there is a parade, you have full, unencumbered access to donuts. I have eaten at many of the finest dining establishments in Cleveland including Greenhouse Tavern, Muse, Amp 150, Moxie and more. All of these places must step aside for local legend Tommy’s in Coventry. Why is Tommy’s the place where you must eat in Cleveland and the best meal you will have? I will build my case with a quote from a tweet I made at the time of my dine: Listening to Tommy tell tales about his restaurant is inspiring. He is so passionate and loves what he does & his community. Tommy’s has always been a business that cares about it’s customers and community. In the eyes of most residents of this part of town, Tommy’s is the heart of Coventry. There is something for everyone – vegan, vegetarian, carnivore, omnivore, locavore, vegetarian, vegan, macrobiotic, and gluten-free eaters have plenty to choose from here. The decision to have such a varied menu is explained in a very matter of fact way by Tommy. He shared that he keeps adding to the menu because he customers want to eat these things and as long as he can make something they will like, he will try it. Health concerns, profit margins, ecological reasons or trends are all peripheral in the food world of Tommy’s. The customer comes first. The food comes a close second with anything else considered bonus points. This is not something that can be taught at CIA or Johnson & Wales, it is not something you can learn on The Food Network. Either you get and give it or you don’t. Tommy Fello cares deeply about his restaurant, employees, customers, community and anything within this sphere. To have anything other than the best for anyone is unfathomable. 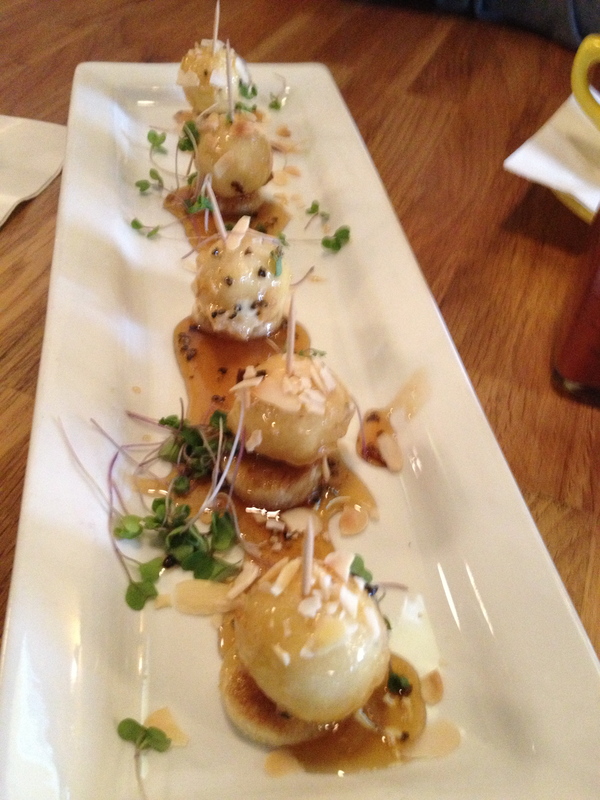 Love is the magic ingredient at Tommy’s and it is infused into every aspect of the menu. Mention Tommy’s to a Clevelander and you will hear the word milkshake within five to ten seconds. Not long after Tommy’s opened in 1972, Rolling Stone anointed Tommy’s as having the best Milkshake east of the Mississippi. There has been no evidence to dispute this in almost forty years. Here are some of the secrets to the magic of Tommy’s milkshakes. The ice cream comes from local ice cream maker Pierre’s. The milk comes from Hartzler Dairy (an organic cow farm in Wooster). The milkshakes are shaken and mixed in old milkshake machines. The thump-thump of a shake poured from the steel mixing cup to a glass is music to my ears. 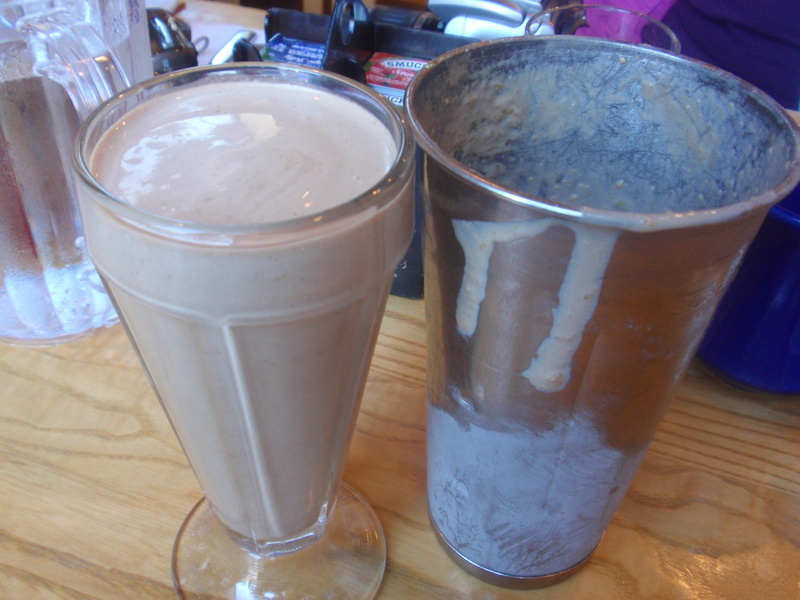 I proclaimed the Chocolate Peanut Butter milkshake the true Breakfast of Champions. In addition to all of the diary goodness I have mentioned, Tommy’s makes their own peanut butter, which is the star of another dish I devoured. Readers that follow me know that breakfast is not my meal of choice. I am happy to eat breakfast at Tommy’s anytime. In part, because both the restaurant and I count a milkshake as a valid breakfast selection. I ordered Elise’s combo. This is not named after the forgotten Borden Dairy cow but after the first customer that ordered this creation (most of the selections on the menu get their names from customers/creators). The combo is a toasted triple decker sandwich with two eggs, bacon, mayonnaise, American cheese and homemade peanut butter. Yes, peanut butter. It is really good – decadent, satisfying and wholesome at the same time. I could be wrong on my opinion of Elise’s greatness but the thousands of other customers that choose this as their breakfast are clearly correct. The menu is gigantic so I will just mention a few more highlights from the selections. 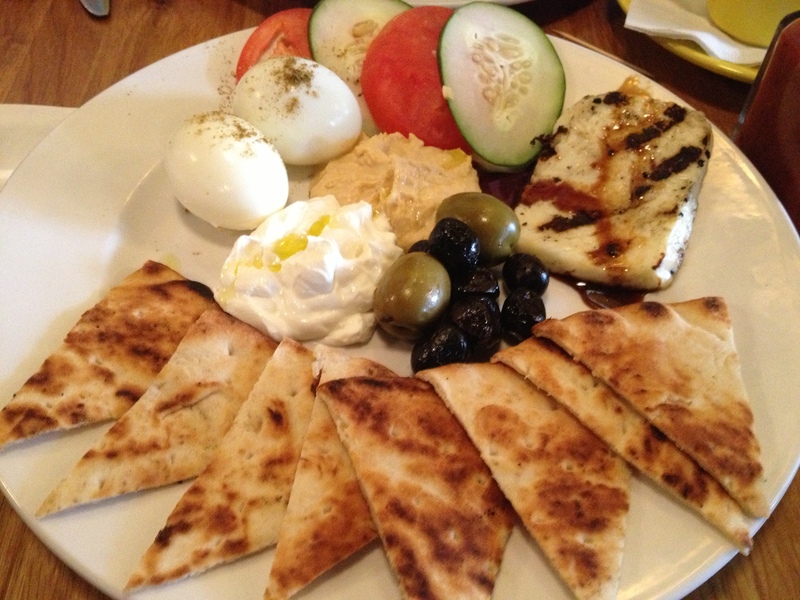 The mention of Tommy’s often brings up another word – falafel. Tommy learned the recipe for falafel from his first boss (the guy he bought the original Tommy’s from). Many people say this is the best falafel ever. It is definitely served in the most varieties anywhere. There are over a dozen falafel sandwich and meal selections on the menu with additions including BBQ sauce, sesame sauce and a variety of vegetables. Here are some random facts that might make you feel good about Tommy’s: The drinking water is filtered, fry oil is non-hydrogenated, soups are made every day, their canola oil waste is given to biodiesel folks, there is a backdoor garden and Tommy’s is the largest consumer of Muenster cheese in northeast Ohio slicing, shredding and serving 680 pounds or more per week. Would you like some more reasons? Attached to the restaurant is a great bookstore called Mac’s Backs so you can read or browse while you wait to graze. Everything is made from scratch tofu, tempeh, stocks, cookies, etc. The Italian sauce recipes are handed down from Tommy’s mommy. Tommy’s may have the best vegetarian French Onion soup in the world made from a base of Shitake mushrooms and chickpea drippings. Big Fun is FUN. It is packed with nostalgic toys, comics, vintage video game systems, wacky t-shirts and more. If it was something that made you happy as a kid, then Big Fun probably has it or will someday. Every trip in offers something new, different or forgotten. A current Big Fun T-shirt creation is “Cleveland, You’ve Got To Be Tough.” This shirt was seen on Anthony Bourdain while he was roaming around a jungle in South America. You will see a lot of “tough” Clevelanders roaming around with and without these shirts. They have taken some hits and they keep going. In Coventry, they are tough too. A group of people created and sustained a community with tenacity and a lot of kindness to each other. They are still at it every day – serving food and fun to neighbors and visitors alike. Any drive on I 70 could be described as mission oriented. The interstate from one side of the state to the other was designed to get people from point A to point B without distractions or delay. This is how I treat that long stretch of road, it is flat, featureless and has nothing to draw my attention. There is one exception. I will set aside fifteen minutes to veer from my course at exit 153 (OH 60 N, OH 146 W). 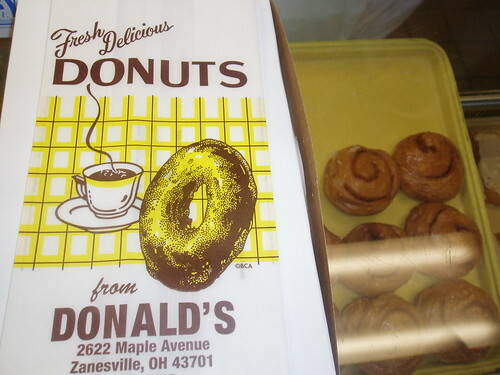 This is not for the thrill of seeing the sign for OH 666, my designated destination in Zanesville is Donald’s Donuts. These are the best damn donuts in Ohio (DK Diner being a very close second). 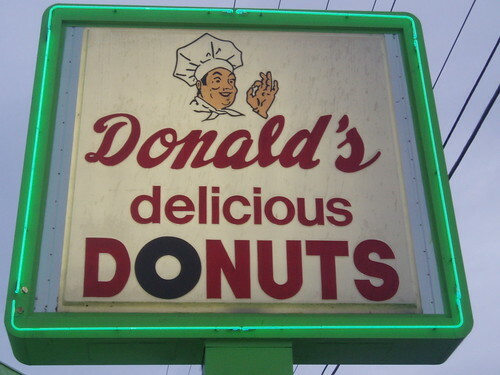 I discovered Donald’s Donuts by accident. I had ten minutes to kill before a business meeting and spied the shop near my turn off. Donald’s is an old school donutery (I made up that word, I may put it on Wikipedia). 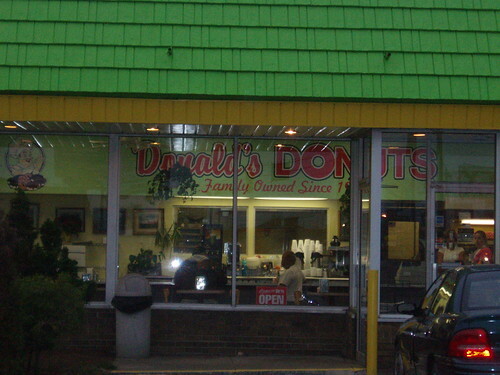 It is a classic donut shop with a lime green awning and mid 20th century mass produced structural nothingness. There is a counter inside that seats ten. The original shop opened in 1960. The current location is spot number two but the building looks like it was fabricated in the 1960’s or earlier. The staff know all of their regulars by name as well as by donut ordering preference. There is a Donald that works there but I am not sure if he is the original. Doing a dash of Donald’s internet sleuthing I found this reference: Don Warne is The Donut GOD. I can not disagree with this pronouncement. After a careful and deliberate study of Donald’s donuts, I have yet to be disappointed by any selection. 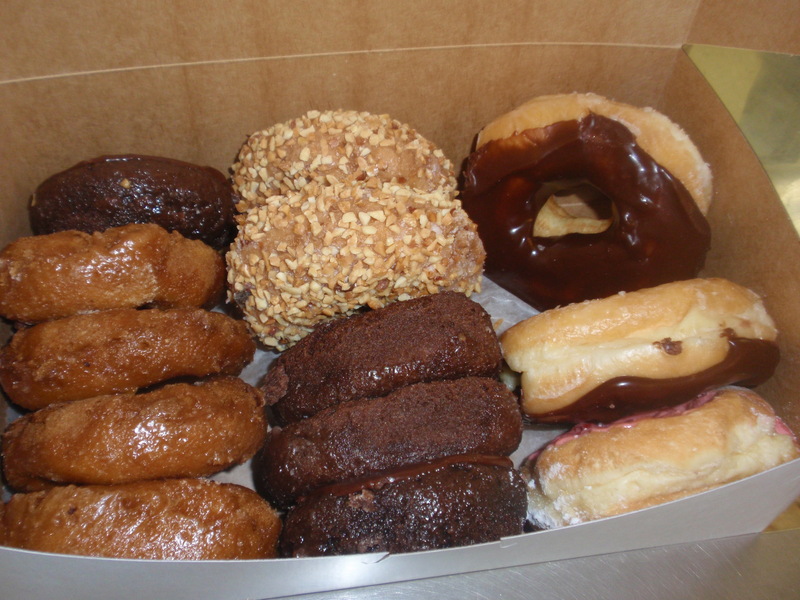 Donald’s offers an assortment of thirty or so donut styles. The shop excels in the cake donut category. These are dense, flavorful, fresh and serve as an excellent foundation for the maple cream frosting that Donald’s uses on a few items. It is fitting that Donald’s is on Maple Avenue because their icing is so good that the street would have been named so by decades of appreciative fans. The cinnamon honeybuns are made in small batches and sell out before 10am. There is also an item that is just refered to as sticks. These long, twisty, donuts have a hint of cinnamon and are coated in the maple cream frosting. 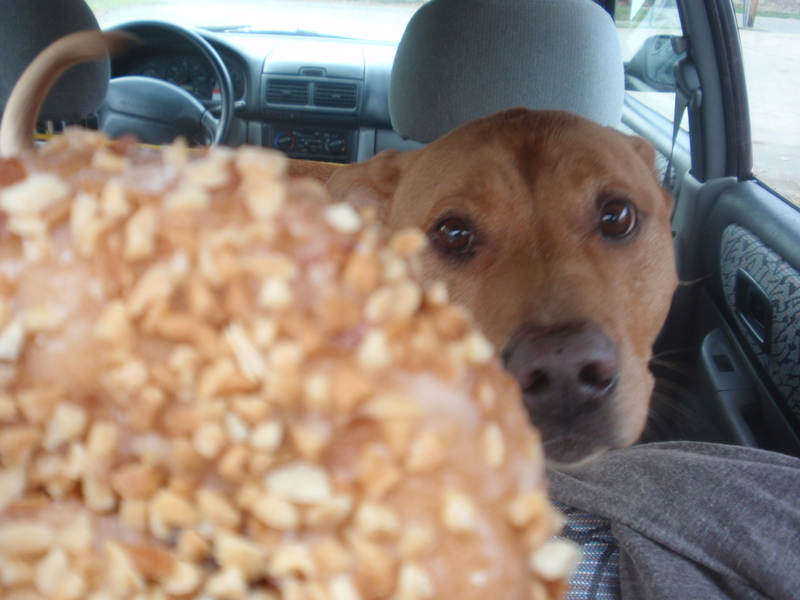 These are so good that @CMHTobias, a dog that has never shown any interest in donuts during our six year relationship, ate two while I was filling the car with gas. (The devestating heartbreak I felt when he closed the donut box with his nose and licked the maple frosting from his snout cannot be described, but it was a very, very low moment for me). An under the radar award winner are the slower selling buttermilk donuts. A woman donut docent behind the counter said these were mostly unappreciated by the Donald’s loyalists. I did have a Paczki (a filled Polish donut) here during Lent that was one of the finest doughed delicacies I have ever consumed. I have had a few Paczki’s over the years. I had high hopes for this donut variant and was very disappointed by each of them. The Donald’s Paczki wiped the slate of shame clean and allowed me to appreciate this Polish pleasuremaker. When I stop at Donald’s I usually get two cake donuts with maple frosting and peanuts and whatever looks fresh from the fryer. Their damn good donuts rarely survive more than two exits after I get back on I 70. 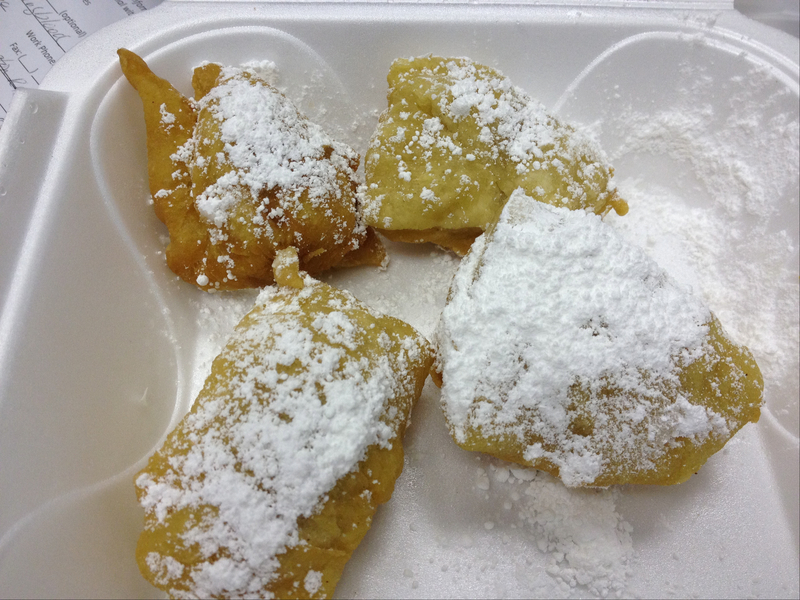 And there is another great donut shop in Zanesville with a family connection – Darrels.